Diabetes comes in the category of metabolic disease and occurs when a person faces the trouble of high blood sugar levels in his/her body. The main cause of diabetes is that either the pancreas is unable to produce sufficient amount of insulin to control the blood sugar levels, or the insulin produced is not well absorbed by the body cells. Type 1 diabetes occurs when the body is not capable of generating insulin and depends upon the insulin, injected from outside. This type of diabetes usually takes place in teenage or when a person is about to come in his 40s. Type 2 diabetes occurs when insulin is produced in sufficient quantity by the pancreas, but it is not easily absorbed by the cells body. This results in high levels of blood sugar. Type 3 is gestational type, which occurs in pregnant women without any prior diagnosis. ● Skin troubles like itching, dry skin, etc. Leaves of jambul plant aid in keeping the blood sugar levels in control. Having it daily makes pancreas more efficient that further benefits the diabetic patients. Bitter gourd juice in the morning empty stomach will help you to maintain an adequate glucose levels in your body in just few months. It is bitter in taste but is really beneficial. Fenugreek is one of the helpful herbs that help to control your diabetes. You just need to immerse fenugreek seeds in water and leave them overnight. Eat them the next morning empty stomach. Also, you can have crushed fenugreek in your milk daily to treat your diabetes. Guavas are a rich source of vitamin C and also highly fibrous. Eat a guava a day and keep a healthy glucose level. Soak mango leaves overnight in water and eat them the next morning empty stomach. Alternatively, you can also have them in powdered form with water twice a day for great results. Cinnamon is bliss for those suffering from diabetes. Mix 4 teaspoons of cinnamon powder in water and let it boil on a low flame. Consuming this daily helps to keep maintain healthy blood glucose levels. Aloe Vera is widely used for numerous body ailments as a home remedy, and diabetes is not an exception. Mix equal amount of aloe vera juice, turmeric and bay leaf and have it every day empty stomach. This helps in controlling the blood sugar levels..
Water greatly helps in maintaining a healthy glucose level inside the body. Consuming adequate amount of water daily brings drastic improvement for those suffering from diabetes. Sunlight is the greatest natural source of vitamin D, which is actually fundamental in controlling blood glucose levels. Sit in sunlight early morning to keep the troubles at bay and to stay healthy. Indian gooseberries are a great source of vitamin C and help out the pancreas to produce optimal quantities of insulin. Consuming 2 teaspoons of amla juice with water every morning, on an empty stomach keeps you away from the problems. Fig leaves have anti-diabetic properties for which they are used in valuable treatment of the disease. Boil fig leaves in water and having it just like tea. You can also opt to chew them empty stomach early morning to get away with diabetes. Grape seeds have vitamin E, flavonoids, linoleic acid, and are known to treat the diabetes. You can have a capsule, having grounded grape seed extract to treat the disease. Garlic is known for its properties not only to lower down cholesterol level but also to keep diabetes away. Garlic contains a chemical called allicin, which has hypoglycemic effects. Neem posses both anti-fungal and anti-bacterial properties and is considered to be good enough in reducing the insulin necessities of the body to a great extent. Curry leaves are easily found in an Indian kitchen. Consuming these leaves in ample amounts can also help diabetics. Chew up 10 to 12 fresh, rinsed curry leaves everyday for good results. Diabetes is a critical medical condition, but with a healthy diet and regular exercise, controlling it becomes quite easy. 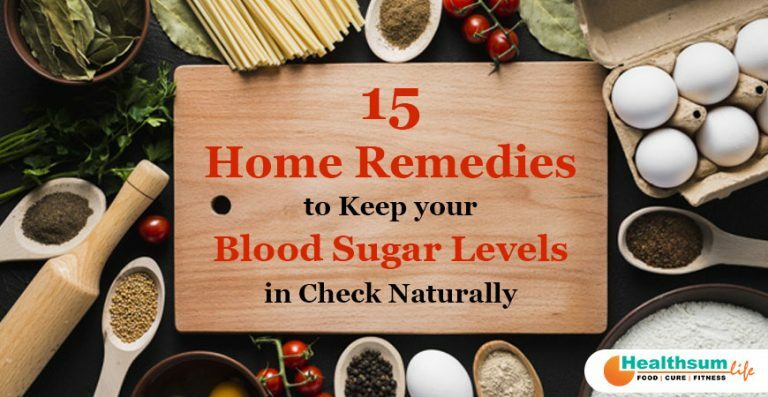 You can follow the above discussed home remedies to keep the fluctuations of sugar levels under control.